Open Pedagogy: What’s In It For You? Most instructors understand the benefits of Open Educational Resources (OER) for students in terms of cost-savings and retention. But increasingly, instructors are also seeing the benefits of using OER in the classroom, through Open Pedagogy, or Open-Enabled Pedagogy. 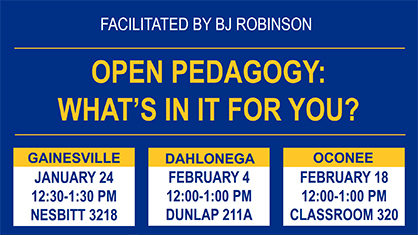 In order to help instructors consider how Open Pedagogy can help them teach, this workshop will define Open Pedagogy as an active form of learning, examine best practices in Open Pedagogy, review examples of Open Pedagogy across disciplines, and brainstorm Open Pedagogy ideas for the classroom.